The front panel features eight analogue inputs on combination connectors, with the first two assigned as instrument inputs. Two headphone outputs are available, as well as a level control for outputs 1-2. The US20x20 is the new flagship model in Tascam’s range of ‘x’ USB audio interfaces, a range which also includes two-, four- and 16-input versions. It promises to be a versatile unit, with a generous number of inputs and outputs, fast USB 3 bus speeds, and sample rates up to 192kHz with no restrictions placed on the number of simultaneous analogue inputs at higher rates. It’s also punted as a digital mixer for rehearsals and performances, and as an eight-way external preamp/converter, in which scenario it works as a stand-alone device, with signals from the first eight analogue inputs being routed directly to the ADAT optical outs (limited to 44.1kHz for eight channels). First impressions are a pleasant surprise. The 20x20 really looks the part, decked out with a smart black metal case and angled ‘props’ to each side to tilt the interface at a jaunty angle on the desktop. Having used a number of similar interfaces without mounting them in a rack — only to have them slide around or scratch my hands with their sharp brackets — such a design feature is wholly welcome. Fit and finish are impressive; the case lacks the sharp edges to the case/mounting holes or wobbly dials found on some other interfaces, with all controls feeling reassuringly solid. Rackmounting ears are also supplied in the box. The front panel houses eight XLR/jack combination connectors, with the jack component on the first two being reserved for instrument level and the remaining six offering balanced line level. Phantom power is applied to the inputs in two banks, and preamp gain controls are situated to the right-hand side of the panel, with simple LED input metering to show activity or clipping. Personally, I find the numbering arrangement of the knobs (up/down in pairs) a little inconvenient when attempting to set and match gain levels and, although the controls’ function ought to be fairly plain, unusually there’s no ‘Gain’ label anywhere on the panel. A level control for line outputs 1-2 (control room) plus dual headphone amps complete the front panel line-up. Around the back, two further balanced line inputs with switchable sensitivity can be found alongside a generous 10 balanced line outputs. Additionally, there’s a full complement of digital connections, including optical ADAT (S/MUX) I/O, coaxial S/PDIF stereo I/O, and word-clock BNCs. MIDI in/out is also present, and the unit is powered by an external AC supply, included in the box. A USB 3 socket is provided, and this is backwards compatible with USB 2 (both cables are supplied with the interface). Crucially, at the time of writing, USB 3 operation is limited to the Windows operating system, but there is talk of a suitable Mac OS driver being developed for the most recent iteration of OS 10.11 (El Capitan). If you own a recent Mac with USB 3 support and want to enjoy the full range of inputs and outputs the 20x20 has to offer with minimum latency, you perhaps ought to keep a close eye on developments before rushing out to buy a US20x20. The rear panel houses line inputs 9-10, 10 line outputs, plus an array of digital and MIDI ins and outs. Connection to the computer is via a USB 2 or USB 3 cable (both included), whilst power is provided by an external AC supply. Installation is a real breeze compared to the veritable labyrinth other manufacturers tend to lead you through. Drivers and control software are downloaded directly from the Tascam web site without any need to create a user account or register hardware. Firmware updates are also available here and are simple to apply. Unlike the smaller audio interfaces in the range, there’s no DAW or plug-in software bundle included with the 20x20. Tascam’s decision here assumes that users will already have chosen their preferred DAW when ready to move to a larger interface, but it would have been nice to have the option to download a basic DAW with which to get started. The Settings Panel control software takes the form of a virtual mixer, where a foldback mix can be very quickly established to monitor at source all the inputs being used. In digital mixer mode the panel mixes and processes input signals and passes them on to the main (front of house) outputs and a series of foldback mixes via pre-fader sends and line outs. On a more fundamental level, the Settings Panel allows the user to set the monitor volume for each input mic/instrument whilst recording, then pan it and add ‘comfort’ reverb effects using the send on the channel strip. Whilst reverb returns are routed directly to the main mix — and therefore not recorded — there is the ability to add filters/equalisation and dynamic processes to each input, and these are recorded. The EQ is perhaps more suited to use in the digital mixer mode, and although heavy pumping compression is usually to be avoided during recording, the ability to apply compression ‘on the way in’ on each individual input, should you choose, is a really neat feature. There is a scene snapshot function, which makes it easy to recall mixer settings for different input combinations, and the user can rename scene presets, as well as use custom-named channel strips on the mixer panel. The US20x20 Settings Panel being used to set up a ‘zero latency’ foldback mix including a DSP reverb. The virtual mixer allows the user to store snapshots and name individual channel strips, whilst dynamic and EQ processors provide the means of pre-processing input signals prior to being recorded. The Settings Panel is designed to be user-friendly, but inflexibility in cue-mix routing may well disappoint the more advanced user. The foldback mix follows the main control room mix, with the two headphone outs playing the very same mix. Consequently, only a single mix is possible for both foldback and the control room during recording. Trying to get around the limitation, I had the bright idea of routing inputs directly to a line output with a pre-fader send, and employing an external headphone amplifier... But since the playback/software signals don’t appear anywhere on the mixer panel, there’s no way to route playback of previously recorded material to a pre-fader send. There’s only a single way to do things, which I personally find counter-intuitive compared to my usual workflow, where the control room and monitor mix are separate. Perhaps this is not a real surprise considering the price. All the same, less experienced users will find setting up a monitor mix really straightforward, albeit with the caveat that they must remember to mute the studio monitors whilst inputs are ‘live’, to negate the onset of feedback. In use, the first observation is how well the case format functions on a desktop, providing easy access when plugging things in and manipulating controls on the front panel. Microphone preamp and playback quality is perfectly fine — not adding any specific sonic colour but with preamps providing plenty of gain without any discernible noise, even when set at fairly high levels and using a passive ribbon mic. The instrument inputs, meanwhile, provide a simple method for DI tracking, again with low levels of noise. I experienced good results when recording a ‘backup’ acoustic guitar feed straight from its internal pickup; in the mix I ended up using some of this signal to supplement the M-S combination used to mic up the guitar. The Settings Panel software, despite its routing frustrations, is extremely intuitive to use, with everything laid out just as you’d expect on the virtual mixer (although some more guidance in the documentation on how to use this would be beneficial for the less experienced user). The foldback mix can be set up within seconds, and the headphone preamps are sufficiently loud for even the highest impedance cans. Reverb effects are bright and perfectly adequate as a guide during tracking, but the Hall algorithm seems to ring on in perpetuity at certain frequencies. It took me a few minutes to work out where this unusual noise was coming from when recording a vocal line — there doesn’t seem to be a feedback loop anywhere, so I assume there is a glitch in the signal processing somewhere. The other algorithms don’t exhibit this issue but are a little noisy, with small bursts of gated noise at higher return levels. This doesn’t affect the signal being recorded, but may deter potential users who want to use the interface as a digital mixer in a performance. However I’m certain that this will be addressed in a future firmware update. With USB 2, I was able to trigger software instruments reliably with a buffer setting of 64, whilst a setting of 32 yielded an occasional glitch to interrupt the audio stream. When measuring latency, the 20x20 was able to achieve very similar results to a Firewire interface I regularly use, although both the Firewire box and on-board MacBook sound had no problem playing back audio at the smaller buffer size of 32. On a loop-back test, the Tascam introduced a further 106 samples (2.6ms) of unreported latency; at the 64 buffer size this equates to a total round-trip latency of 11.26ms on my four-year-old MacBook Pro. Having used it for a few recording sessions, I’ve really grown attached to the US20x20. Despite a few reservations, it’s a feature-rich, easy to use and clean-sounding interface (discounting the gremlins found in the reverb). For a band wanting to track in a home studio, or someone who simply must have lots of line outputs, this sturdy interface is extremely worthy of consideration. Once USB 3 operation is supported on OS X, the US20x20 will become an even stronger contender at its price. As it is, Windows users with USB 3 on-board should definitely take a closer look. The Focusrite Scarlett 18i20 is similarly matched to the Tascam in terms of features, but has the two independent headphone cue mixes that the US20x20 lacks, plus a pad switch on the first two preamps. The Scarlett is limited to USB 2 bus speeds and recording sample rates up to 96kHz (compared to 192kHz on the Tascam). Hardware input metering and enhanced monitoring controls are also welcome additions, but there are no DSP effects on the cue mix. The similarly priced Zoom UAC8 should also be worth a look. It’s a USB 3 interface like the Tascam, featuring an input polarity switch and high-pass filter on inputs (both software controlled), plus basic DSP effects on the headphone mix. Tascam’s Trackpack aims to provide everything you need to get started with recording. It includes an entry-level USB 2 audio interface from the same product range as the US20x20, a condenser microphone with mini desktop stand, closed-back headphones, and a short XLR cable. A software bundle is also included, but just like the US20x20, Windows users fare most favourably in this respect. Whilst they receive a functional entry-level DAW for recording in the form of Sonar SE, Mac users have to make do with the dance-music focused environment of Ableton Live Lite. The Trackpack 2x2 attempts to provide an all-in-one home studio solution including a two-channel interface, condenser microphone and headphones. In use, the interface shares many commendable features with its bigger relative. Clean preamps, great build quality and the option to switch the direct monitoring to stereo mode (input 1 panned left, etc) are all plus points. The microphone functions fine on both vocals and instruments for demo recording purposes, exhibiting an ‘airy’ high frequency response due to its relatively small (18mm) diaphragm, and it tends to require equalisation. The closed-back headphones offer good separation from spill but sound quite ‘boxy’ to my ears, seemingly missing some detail in the mid range. In my humble opinion the US2x2, when purchased alone, represents a very good buy — a worthy contender to the likes of the Steinberg UR22. For the premium in price however, the microphone and headphones combination doesn’t offer as much added value as I hoped for. Pitching in a little extra money would buy you a large-diaphragm condenser from an established mic manufacturer with which to better complement the US2x2. The same is true for headphones, where accurate frequency response is crucial to ‘speaker-less’ mixing in a home studio. All in all, the Trackpack offers a fair all-in-one solution for demo recordings, with the possibility for far more impressive results once the audio interface is ‘unbundled’ from the included peripherals. 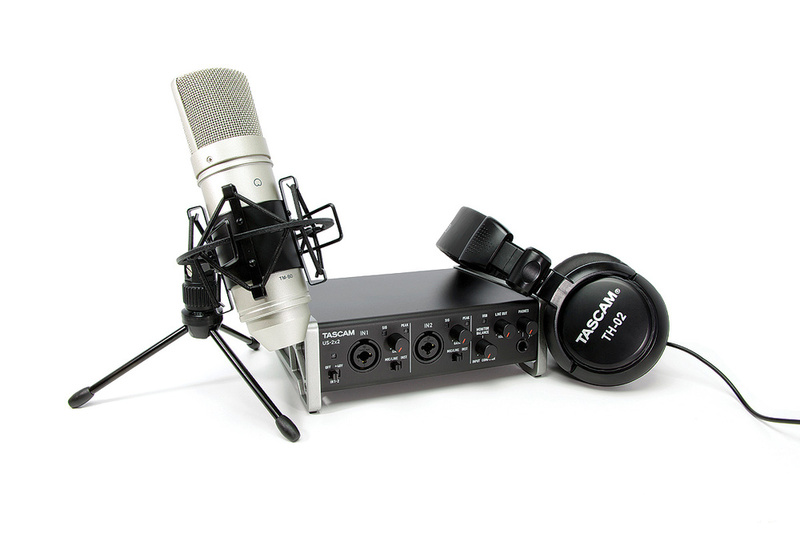 Tascam Trackpack 2x2 £169, US2x2 £99.99. Prices include VAT. Tascam Trackpack 2x2 $199.99, US2x2 $149.99. USB 3/USB 2 (USB 3 currently Windows only). Recording qualities up to 24-bit/192kHz. Requires Mac OS 10.8 or higher; Windows 7 or higher. iPad compatible using iOS 7 or above and Apple Camera Connection Kit. Eight analogue inputs on XLR/jack ‘combi’ connectors (two instrument inputs/six line inputs on the jacks). Two additional balanced line inputs with switchable level switch. Hardware monitoring and DSP effects; reverb, compression and EQ. Snapshot scene memories and multiple pre-fader sends for live digital mixing. Ten balanced TRS line outputs. Two headphone preamps (both carrying the same mix). Optical ADAT digital ins/outs (eight channels at 44.1kHz). Supplied with USB 2 and USB 3 cables, AC power supply and rackmounting brackets. Build quality and case design impress. A multitude of inputs and outputs with low levels of noise. Monitor mix DSP effects and simple operation of the Settings Panel. Competitively priced compared to rival USB 3 interfaces. USB 3 operation currently restricted to Windows only. 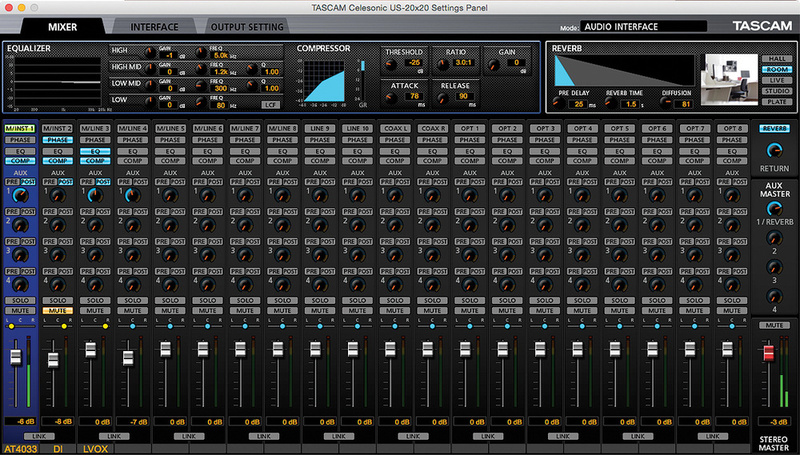 Inflexibility in monitor mix routing — no scope for multiple/independent monitor mixes during tracking. A few strange noises encountered in reverb effects. A versatile, easy to use USB 3 audio interface featuring a wide array of I/O and DSP effects on the foldback mix. Highly recommended for Windows users, but Mac users should wait until USB 3 is supported.